For a designer, there is nothing more exciting than being asked to remove all constraints, ignore all the conventions, and explore new frontiers offered by a cutting-edge manufacturing technique ― in this case: 3D printing. To literally "design something you can't make." It's in these moments that the sparks of genius are often fanned into flames, and true innovation is born. Such was the tantalizing challenge issued at LIXIL's North American luxury brand, DXV, as the group set out to revolutionize the very idea of faucets. They succeeded in doing something no one else had before them, creating the world's first commercially available 3D printing faucets. From the aerospace industry to the automotive, medical, and pharmaceutical, companies worldwide are increasingly incorporating 3D printing technologies. It is changing how they work, from product development processes through to manufacturing methods. 3D printing is even facilitating the use of new materials in some industries. In the healthcare arena, for example, the first 3D printed pill was created using a porous formulation that easily dissolves in the patient's mouth. According to Wohlers Associates, an analyst firm, the size of the 3D printing market grew to an estimated $6.063 billion in 20161. While available since the 1980s, 3D printing's rise over the past decade has been sudden and dramatic. In fact, according to advisory firm Ernst & Young, one-third of companies it surveyed with experience in 3D printing already use it for direct manufacturing2. And looking ahead, global research and advisory firm Gartner predicts that by 2020, 75 percent of production facilities globally will be using 3D printed tools, jigs and fixtures for the manufacture of finished goods3. It was the immense opportunities of 3D printing that led DXV to "think outside the box" – to look beyond the norms. The gauntlet was originally thrown down by Jean-Jacques L'Hénaff, LIXIL Americas Vice President of Design for the DXV and American Standard. He tasked the team with exploring different ways of presenting water to the user, to think beyond the traditional faucet, and challenge the boundaries of shape, design and experience. The faucets product category has traditionally overwhelmed consumers with similar designs, even at the bespoke level. The objective now was to offer the consumer something never before imagined. As the team experimented with the 3D printing process known as direct metal laser sintering (DMLS), ideas began to take shape ― literally. Out of a pan of powdered metal, rough ideas formed one layer at a time. 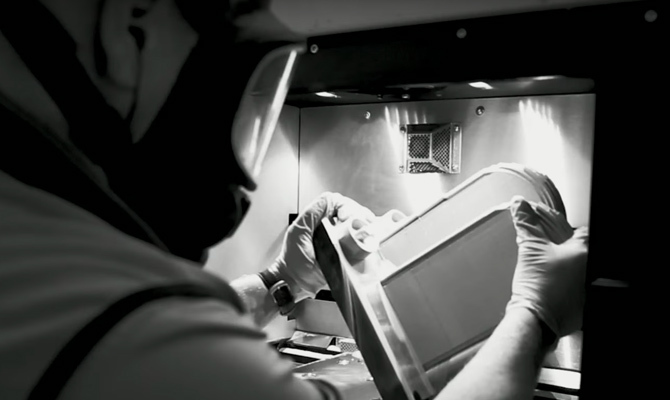 Unlike the fused deposition 3D printing techniques that many consumers are more familiar with ― used to create everything from replacement car parts to smartphone cases ― DMLS does not melt a substance down in order to form an object. Instead, a laser "sinters," or uses high heat and pressure to form a solid mass of material from successive layers of powder. 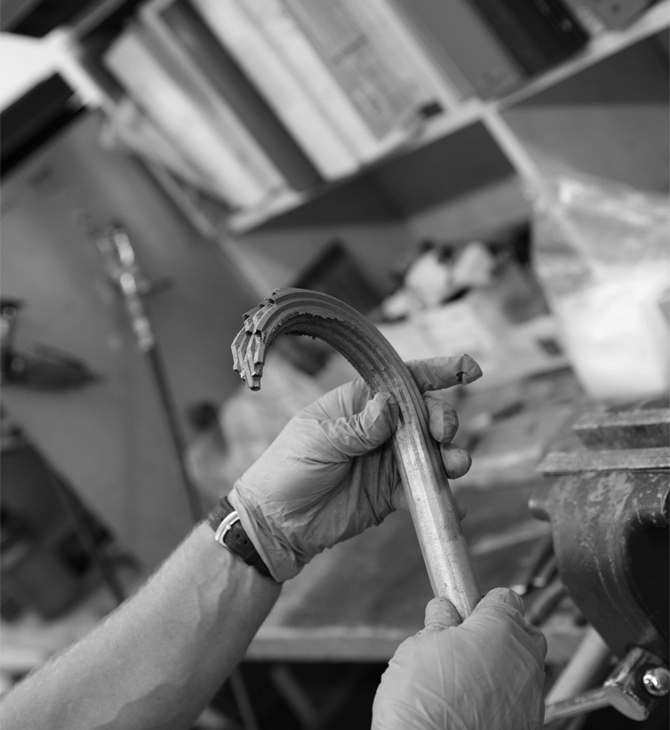 A solid metal block gradually arises out of the powder, and extraneous metal is smoothed away to reveal the design. This technique allows for greater flexibility in the creation of complex forms. Although both American Standard and DXV had been using fused deposition modeling to create faucet prototypes for years, DMLS opened up new ways to imagine conveying water. "It gave us an opportunity to look at the product in a different way and design with very few manufacturing restrictions," explained L'Hénaff. The result of these efforts was the birth of three completely unique designs that redefine water delivery and presentation – in patterns that at first seem physically impossible. Vibrato and Trope at first simply mystify onlookers, as they defy preconceptions on how a faucet delivers water. As the eye is drawn to the hollow stems of both designs, it takes a moment to process how water could flow from their gracefully arched spouts. Once your brain has accepted what's happening, your eye is drawn back to the design. 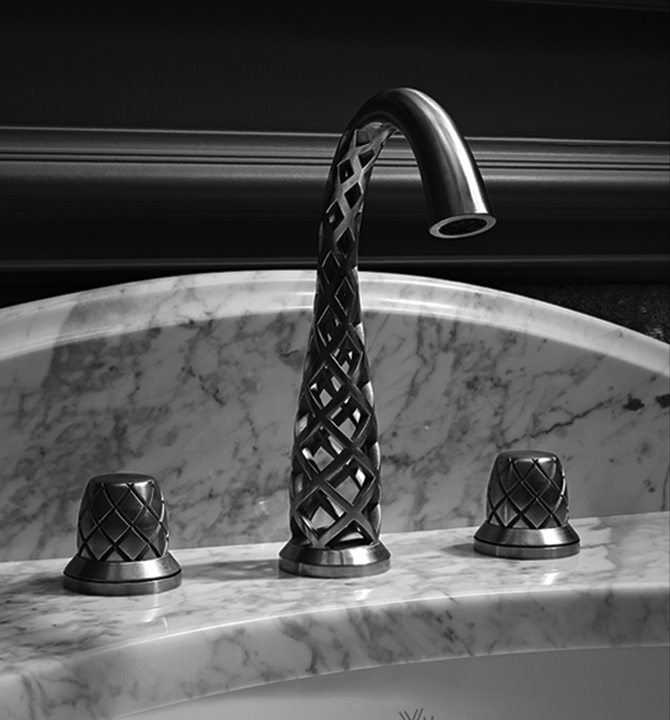 Vibrato showcases a latticework of waterways that converge just before the spout, while Trope features a waterway split into four thin ribbons. The design of Shadowbrook focuses on the presentation of water delivery. Complex Computational Fluid Dynamics (CFD) software was used to create a tranquil effect – as 19 separate openings release water to mimic a shallow stream bouncing off pebbles. If the design team wondered what the reaction to the line might be, they didn't have to wonder for long. When the prototypes were unveiled to interior designers at a launch event in June 2015, "we turned the faucet on, and there were two seconds of absolute silence," recalled L'Hénaff. "And then, there was this audible gasp," he said with a smile. 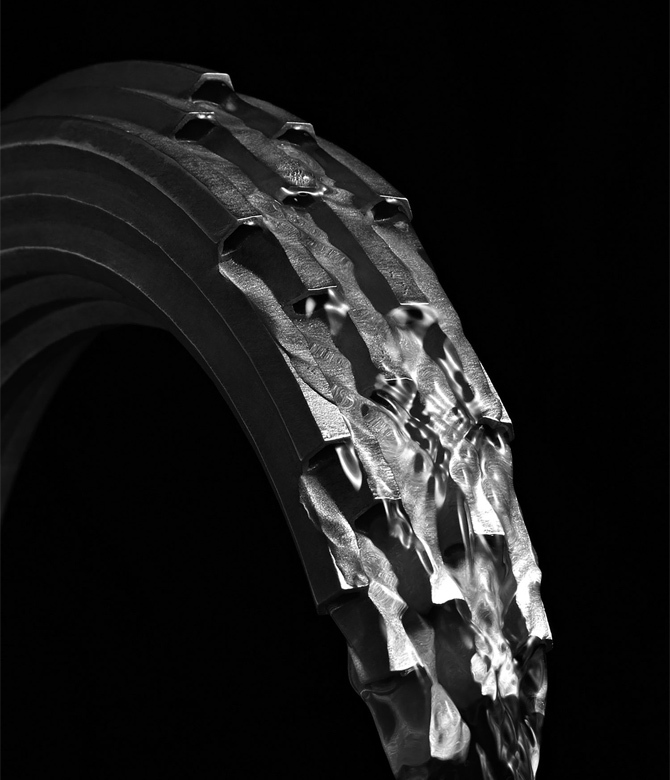 L'Hénaff is acutely aware of predictions regarding the changes that 3D printing will usher in. He believes that given time, 3D printing will someday have a major disruptive effect on the design and manufacturing industry, as traditional production cycles and inventory management procedures are replaced with new processes made possible by streamlined 3D manufacturing. Among the industry-specific changes he envisions would be the elimination of large tooling expenditures, which would no longer be needed. Inventories could be drastically reduced since faucets can be made to order. Additionally, waste and pollution stand to be reduced, since faucets would be made only when needed, with no unused inventory to discard and no shipping resources consumed for unsold product. As a leader in the development of these new manufacturing methods, DXV occupies the perfect vantage point to not only anticipate and adapt to change, but to guide the industry on its path toward a more efficient business model, and a new paradigm in luxury. It was an exercise in ingenuity that began with "what can we do?" and "how can we do it?" The answers to those questions brought DXV, and the entire industry, one step closer to the future of manufacturing. The employment of technology not to replace, but instead to elevate, represents an important synergy between old and new, art and science. These first-of-their-kind products represent the initial steps in the journey of continued innovation of faucet design, led by LIXIL's DXV brand in the North American market. 1 Wohlers Associates, Inc.; April 3, 2017; Wohlers Report 2017. 2 Ernst & Young GmbH Wirtschaftsprüfungsgesellschaft; 2016; How will 3D printing make your company the strongest link in the value chain? EY's Global 3D printing Report 2016. 3 Gartner; November 15, 2016; Gartner's annual predictions about the future of 3D printing.